Just the memory of this dip makes me want to run to the kitchen and caramelize some onions. This is a dippy treat for all onion lovers. I have adapted the recipe a bit from Kitchen Simplicity (here). Thank you, Cheri. We’re loving it! The only thing that keeps this dip from being an almost instant treat is the time it takes to caramelize the onion. Put this recipe together when you are already in the kitchen puttering with something else, like those never-ending dirty dishes. 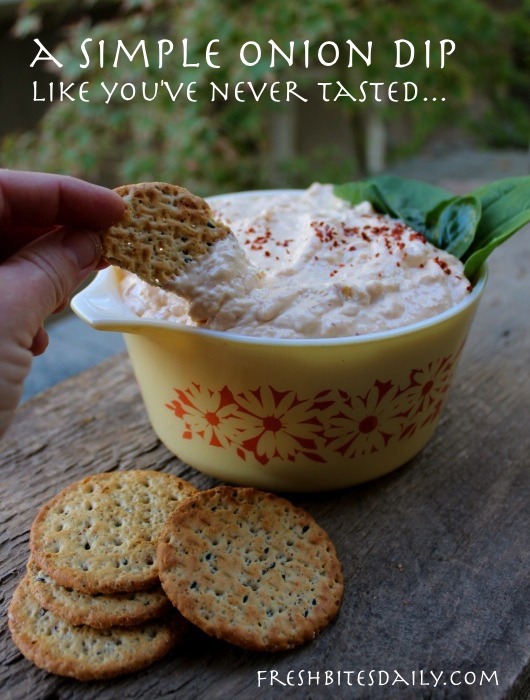 The dip stays good for about a week when refrigerated in a glass container with a tight-fitting lid. Make plenty and try using some of the dip later in the week as a sandwich spread. Heavenly! Heat the oil in a heavy skillet. When the oil starts to shimmer, add the onion. Turn the heat to medium low and let the onion cook until it just begins to brown. You will need to stay close and stir the onion now and then. As the onion begins to brown, add the garlic and cook for another 2 or 3 minutes. Do not let the onion or the garlic burn. In a food processor or blender mix up the sour cream and the kefir cheese until smooth and well blended. Add the onion and garlic mixture to the cheese mixture. Whiz for about a minute. 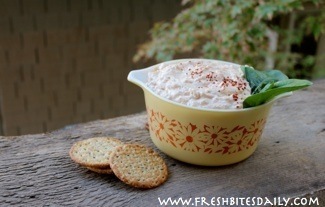 Scoop the dip into a serving bowl and garnish with smoked paprika or sumac.